A few weeks ago, a new friend of mine asked me to make beer-can chicken. He had never had it before and had always wanted to try it. At first, I was surprised because_to me_beer-can chicken is as common as a peanut butter and jelly sandwich. But then, I posed the question to the other people invited to dinner, and none of them had ever made beer-can chicken. And, only one of them had tasted it before because he had it at my house! That was when I realized that I needed to re-visit beer-can chicken. It is my go-to main course and my comfort food. It never fails to satisfy. The skin is crispy and burnished by the convected heat of the grill. But that’s not all — the chicken is tender, juicy and has a slightly smoky but pure chicken flavor that is accentuated by the steamed beer. I make it almost once a week in the fall and winter. What I serve with it varies based on what’s in season, but my favorite back-pocket meal is beer-can chicken, grilled asparagus, sweet potatoes and cornbread. If you know how to make beer-can chicken, you will always be able to make a great grilled meal for yourself, and/or your friends and family. The key to beer-can chicken and in my opinion, great grilling, is indirect heat. And to understand indirect heat, you must understand direct heat. Once you understand the difference between direct and indirect heat and when to use it, you will be able to cook anything. I use indirect heat or a combination of the two at least 80 percent of the time that I use my grill. — DIRECT GRILLING means that you put the food directly over the heat source_similar to broiling in your oven. — INDIRECT GRILLING means that the heat is on either side of the food and the burners are turned off under the food_similar to roasting and baking. This technique works well for everything from chops and steaks to whole tenderloins and even slices of denser vegetables such as sweet potatoes. It is a time honored and well-respected tradition and the outdoor grill version of the way most restaurants chefs cook almost everything_searing on the stovetop and finishing the dish in the oven. Now that you know the difference between direct and indirect cooking and how to use it, you are ready to make beer-can chicken. I guarantee that if you make it once, you’ll make it over and over again and it will become an instant family favorite! I truly believe that it is the best way to prepare a roasted chicken, bar none! Beer-Can Chicken is easy to love. Once you understand indirect heat and how to set your grill for it, I know that beer-can chicken will become your go-to winner dinner. A porcelain chicken sitter makes the cooking a little easier because it has a flat bottom that can’t tip over as the chicken cooks. 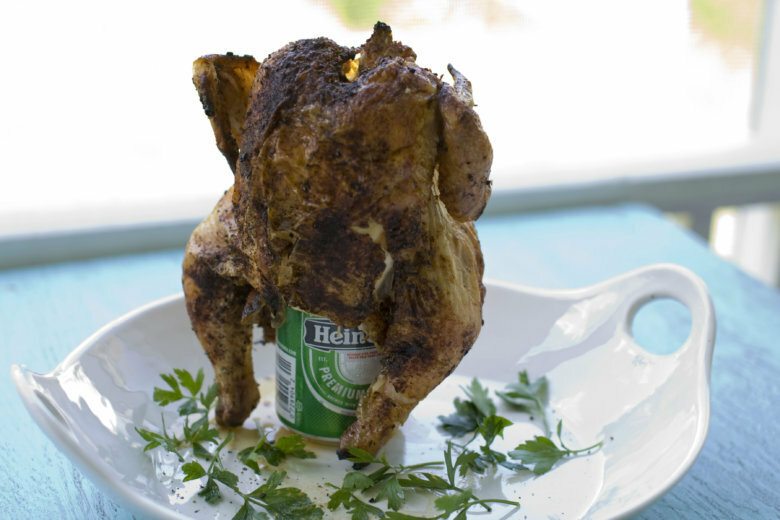 If you use a beer-can, you must make sure that the legs of the chicken are positioned in front, like a tri-pod to stabilize the chicken and the can. If you prefer a classic roasted chicken flavor, use only kosher salt and black pepper to season the chicken. If you want it to have a “barbecued” flavor, use your favorite dry rub. If using a dry rub instead of salt and pepper, sprinkle about a tablespoon of it inside the Chicken Sitter or beer can. Place the chicken sitter or beer can in the center of the cooking grate over indirect medium heat and “sit” the chicken on top of the beer can. The chicken will appear to be sitting on the grate. Make sure the legs of the chicken are in front of the Sitter or the beer can to support the chicken as it cooks. Nutrition information per serving: 389 calories; 183 calories from fat; 20 g fat (6 g saturated; 0 g trans fats); 132 mg cholesterol; 606 mg sodium; 3 g carbohydrate; 0 g fiber; 0 g sugar; 41 g protein.